Guilt. It's a mother's curse. My day started with guilt over making my son wait out for the bus on a cold, cold fall morning. Guilt over not wanting to drive him when the bus never showed up. Guilt over giving in - and then changing my mind - to his pleas to take a lazy day off. I moved onto guilt over not giving into my 5-year-old's begging and pleading for an adorable and pricey set of dolls. And then a bit of guilt over making a dinner main dish that two of my four kids wouldn't touch. And now - to top it off - I'm experiencing blogger's guilt. Guilt that I didn't photograph this soup while it was in the making. 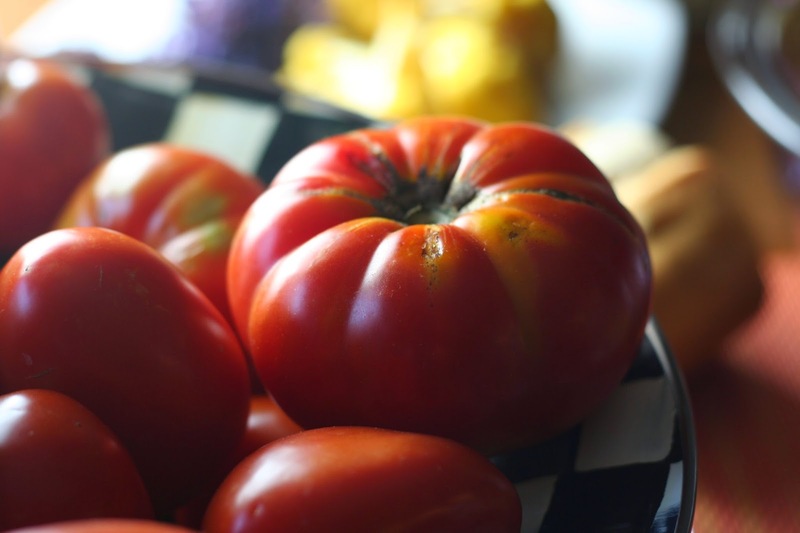 Guilt over depriving you of photos of that big beautiful cutting board spilling over with ripe, juicy tomatoes. I was harried. And hassled. And still feeling bad about our bad start to the day. Sorry, folks. To make up for it, here's an amazing recipe from the amazing Bountiful cookbook. It made my kids happy (they ALL LOVED IT! It was a miracle!) and I hope it'll make you happy. This is a new favorite, direct from the authors of the White on Rice food blog. In a very large pot, heat the oil over medium heat. Sauté the onion for a minute or two, then add the celery and sauté for another couple of minutes. Add the tomatoes, vegetable stock, parsley and basil. Mix well and turn up to high till it comes to a boil. Turn down the heat and cook for 10-15 minutes (longer if your tomatoes were firm-ish). Turn off the heat and let the soup cool for about ½ hour if you can, so you are not working with dangerously hot soup. 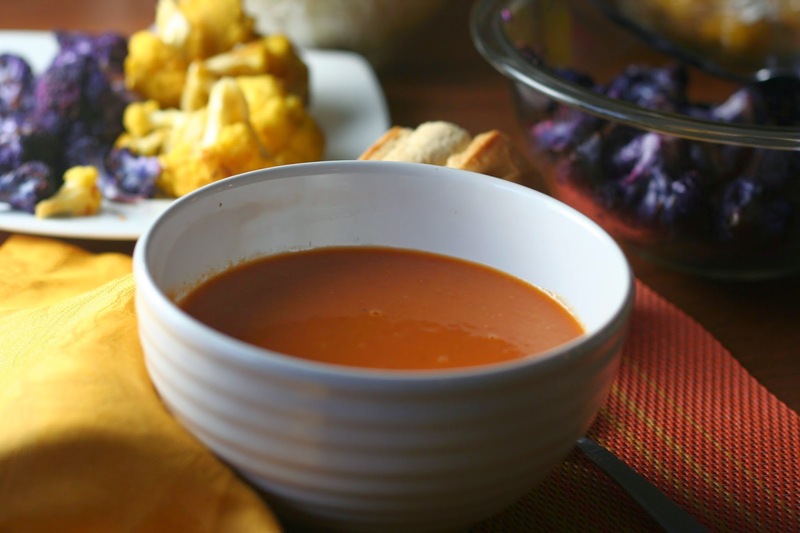 Transfer the soup in batches to a food processor or blender and puree till totally smooth. Return the soup to the pot and warm it gently over a medium-low flame. In a separate saucepan, melt the butter over medium-low heat. Add the flour and cook for about 5 minutes, stirring frequently. Ladle a bit of the hot soup into the roux. Stir to combine and then pour the entire mixture back into the tomato soup. Add the sugar, salt, cream and milk. Stir well and taste. Correct seasonings as needed. NOTE: Leftovers last for a few days in the fridge and also freeze REALLY well. Wow! This looks really pretty - and it was delicious, too! No more guilt! I think this soup looks plenty delicious as photographed and I can't wait to try it! Tomato soups are so good. You know it's funny, I haven't found too many tomato soups I like. This is a really nice one. Let go of that guilt!! You made an amazing tomato soup! Tomato soup is my absolute favorite, but super fresh tomato soup? YUM YUM YUM! I need this asap!